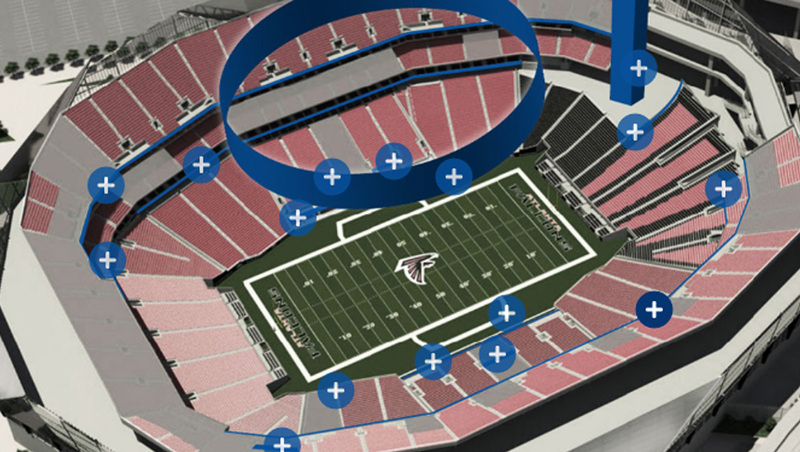 The Mercedes-Benz Stadium in Atlanta, home of Super Bowl LIII in 2019, is packed with over 83,500 square feet of LED video displays. The “Halo,” mounted around the inside of retractable roof opening of the stadium, is 58 feet tall and is side wide that a helicopter could fly through it with room to spare. Just as impressively, the Halo, if it was turned into a pool, could hold as much water as an Olympic sized swimming pool. Its 380-foot diameter is bigger than the Centennial Park Ferris Wheel in Atlanta, which is comes in at 200 feet. If flattened out, the LED surface is as long as three football fields laid end to end. Find out more about the Halo in this infographic. The stadium also includes a 101-foot tall “mega column” with LED covering three surfaces. In addition, an LED “feather wall” on the end of one of the concourses features a unique triangular shape 26 feet tall by nearly 70 feet wide. Besides these impressive LED installations, the stadium also features two upper and two lower suite ribbons. A “pitch level” LED display that measures 519 feet wide by 3 and a half feet tall is complemented by two “field level” displays that are 199 feet wide. Additional LED panels provide closed captioning to attendees, while much smaller installations are found in the stadium’s dining venues and press conference area. All told, the stadium has over 62.5 million individual LEDs. See the Daktronics case study of the project here.